One of the joys of living in the Pacific Northwest is being able to forage during a long hike or walk. The LBA Woods is full of berries right now. Most are native, but not all make great eating off the vine. Here’s a quick guide to what you’ll find on the trails now (late July-early August). Tall Oregon Grape (Mahonia aquifolium). They look like grapes, but not recommended for eating. 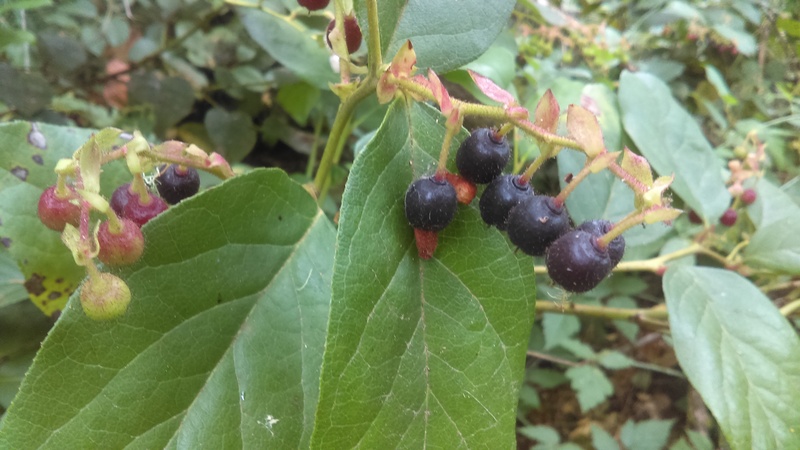 Polar and McKinnon notes these native berries were a traditional and potent antidote for shellfish poisoning and warns against consuming them. Salal (Gaultheria shallon). This native berry can be eaten fresh, dried, or perserved as jam. An acquired taste if eaten off the vine; close to grape jelly if preserved. Bald-hip Rose (Rosa gymnocarpa). These small oval fruits are edible, but not recommended as the seeds contain gut-irritating hairs. Himalyan Blackberry (Rubus armeniacus). A very successful (invasive) non-native berry just beginning to ripen now. Delicious! Thimbleberry (Rubus parviflorus). These delicate native berries are at the end of their season. They are not sold commercially so wild is the only way to taste them. No current action items. Check back here frequently! Get an automatic daily email digest when we post something new! Completely spam free, opt out any time.